Nasa’s landlord is building a new apartment on the site of Nasa’s old residence. The landlord has a model apartment in the Yukari House apartment building, so Nasa and Tsukasa go to check it out. They are stunned to see Yukari House is a luxury apartment tower. Inside the model apartment, they find more luxury including high ceilings, amazing views, and a bath that also has a view. This causes Nasa to imagine the sweet couple bathtime he’d get to have with Tsukasa. They check out the luxury bedroom, which has a queen size bed in it. Nasa and Tsukasa agree that if they get a new place, they want a bed like this in it. Nasa asks if they can sleep together in a single bed, should they get a new apartment. Tsukasa agrees to it. On the way home, Nasa gets a text from his landlord, stating that the new apartment won’t be as grand as the model they were shown. Nasa promises to work hard so they can live in a house like that. Tsukasa is happy with this, but tells him that she’ll be happy to live in a small place or old place with him. Whatever residence Nasa lives in is one Tsukasa will come back to. Whew. 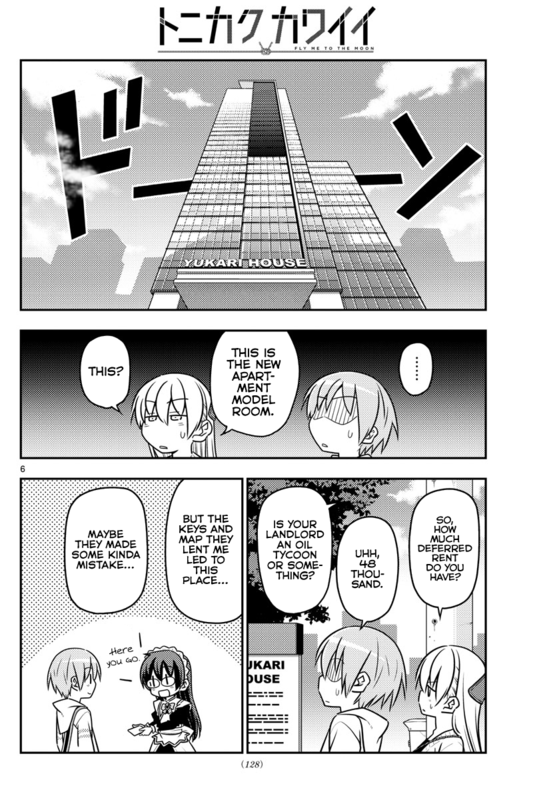 Tonikaku Cawaii chapter 38 gives us a fun little chapter looking at a model luxury apartment. And we get a couple of Hayate the Combat Butler nods as well. I remember from my apartment hunting days how there was always a model room based on the kind of room one was trying to rent. And as always, these things were decked out to the max to look amazing. But when it came to looking into new construction for homes, it was even worse because the model homes would always have the maximum upgrades. And naturally, that raises the price by a ton. ? So when I saw Nasa and Tsukasa going through a similar experience, I had to chuckle a bit. I can’t even imagine how outrageously expensive the Yukari House apartment would cost per month. And I did get a laugh out of Nasa getting a text from his landlord (Wataru) that the new apartment would not be that decked out. As an aside, this was the first of the Hayate the Combat Butler references. Yukari-chan House was the old apartment house that was owned by Nagi’s mother Yukariko. 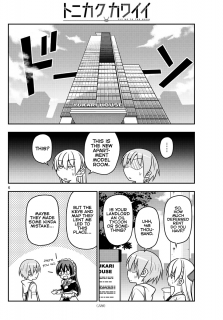 If I recall correctly, Hayate the Combat Butler mentioned they might finally building a new apartment tower on the site. If so, we see the results. Throughout the Tonikaku Cawaii series, Hata-sensei has dropped hints as to a bigger plot. For starters, he’s heavily implied that Tsukasa is the immortal Kaguya-hime (or someone very much like her). And in that story, Kaguya-hime eventually has to leave Earth and return to the moon, where she has her memories of her time on Earth wiped. In Tonikaku Cawaii chapter 38, Tsukasa mentions that any place Nasa is will be a place she will return to. This could be Hata-sensei trolling us, or it could be another plot hint about Tsukasa eventually having to leave Earth. We’ll see what Hata-sensei has in store for us. OK, time to wrap up Tonikaku Cawaii chapter 38. I’m pretty sure that the Raphael that Tsukasa mentions is this YouTuber. Interesting that he wears a mask to protect his privacy. I had to laugh at Tsukasa’s desire to play the treasure trove of console games being a reason for her reluctance to move. We got to see Saki from Hayate the Combat Butler. Initially, it did appear that Tonikaku Cawaii was set sometime around the end of Hayate the Combat Butler. However, I’ve seen the raw for chapter 45, and that clearly has Tonikaku Cawaii set in 2018. But we’ll discuss that more when we get there. Kaname is not only a troll, she’s even more of a pervert than thought. ? In the end, Tonikaku Cawaii chapter 38 is another cute chapter showing the newlywed adventures of Nasa and Tsukasa.